Albion striker Glenn Murray is relishing next season’s clashes with fierce rivals Crystal Palace. The 33-year-old scored 56 goals in his first spell with the Seagulls, before making the switch to Palace in 2011. He helped the Eagles reach the Premier League when he fired home 31 goals in the 2012/13 season but returned to Brighton last summer, initially on loan from Bournemouth before he made the move permanent in January. Palace sealed their Premier League survival with a 4-0 win at home to Hull on Sunday and Murray said: “It’s good for both clubs, it’s nice to see Palace stay up and I am sure all the fans will look forward to the two fixtures next year. 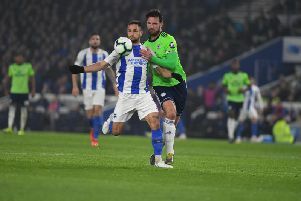 Despite the joy of winning promotion, Albion missed out on the Championship title and Murray said: “It’ll be a regret of all of ours for years to come, but we’ve got the main job done.